This is a "Amazing Spider-Man #1" Autographed Comic Book. Signed & Sketched by "Adam Hughes". This comic book is CGC Graded/Certified a Signature Series 9.8 with White Pages. Variant Pedigree: "Blank Sketch Cover". Comes with the Exclusive "Red" Stan Lee CGC Signature Series Label. We will do our absolute best to describe every item accurately. The condition listed in our description is simply our opinion of the listed comic book based on our experience. 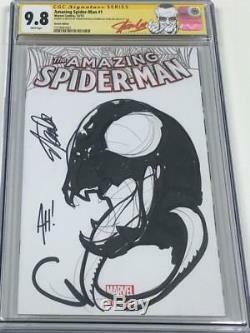 The item "Amazing Spiderman #1 Sketch Signed by Stan Lee & Sketched Adam Hughes CGC 9.8 SS" is in sale since Tuesday, March 27, 2018.